This fully editable template is designed to make your presentations look not just cool and unique, but also to be full of meaning. The slide itself which features the tip of theÂ iceberg can be used to create an analogy when doing business presentations. 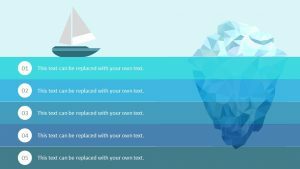 Use the ‘tip of the iceberg’ analogy when detailing the different parts of your plan with the Iceberg Diagram for PowerPoint. 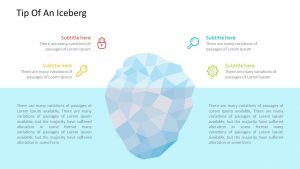 The Iceberg Diagram for PowerPoint is a collection of five fully editable slides that you can use to detail what parts of the company often go overlooked. Use the different slides that are attached to images of an iceberg. Each one has different text blurbs that will go along with each piece of the iceberg you want to talk about. There is also space for you to insert texts and subtitles as well.